Kyle, guest from Project Healing Waters Fly Fishing, landing a nice one. What: A presentation on our fly fishing vacations at Healing Waters Lodge in southwest Montana and our five-day/four-night float trips down Montana’s famous Smith River. 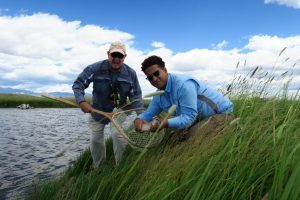 We offer a 6 night/5 day fly fishing school at the lodge, April 22-27; our guide/instructors lead about an hour of class time, followed by guided fly fishing for the remainder of the day with the emphasis on knowledge, technique, and practice, practice, practice for any skill level. With well over 100 miles of access to private water, spring creeks, streams; rivers such as the Beaverhead, Big Hole, Jefferson, Madison, Ruby and Smith; wade fishing and float fishing, we have plenty of options to help make your fly fishing vacation in Montana remarkable. To get the straight scoop, dial 406-459-2030 and talk to the man, Mike Geary. Thank you!